For the English film actor (born 1989), see Matthew Beard (British actor). Matthew Beard Jr. (January 1, 1925 – January 8, 1981) was an American child actor, most famous for portraying the character of Stymie in the Our Gang short films from 1930-35. The role was so high profile that he adopted the name Stymie Beard, credited with this for some later roles, such as his 1978 appearance in The Buddy Holly Story. He was a native of Los Angeles, California. Matthew Beard, Jr. was born near Los Angeles, California. His father was Matthew Beard and his mother was Johnnie Mae Beard (née Clay). His father was also the founder pastor of Beloved Church of God in Christ, located at 7529 S. Main St, Los Angeles. Beard had previously played baby parts in many films before signing a five-year contract to play in Our Gang. In contrast to Farina, the character he replaced, Stymie was a slick-tongued con-artist who was always self-assured, nonchalant, and ready with a sly comment as well as clever ideas to solve the problems he faced. Stymie could also offer sound, commonsense advice that helped resolve the dilemmas of his playmates. The character's trademark was a bald head crowned by an oversize derby hat, a gift to Beard from comedian Stan Laurel, who had also worked under Our Gang creator Hal Roach. Stymie is the only Our Ganger who both replaced one of the original gang members (Allen "Farina" Hoskins) and was in turn replaced by one who would stay on until the series disbanded, Billie "Buckwheat" Thomas. The name "Stymie" was provided by Our Gang director Robert McGowan, who was always frustrated ("stymied") by little Matthew's curious wanderings around the studio; the character was originally to be named "Hercules". 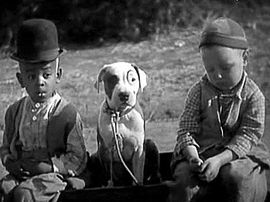 McGowan would later recall that Stymie was his favorite of all the Our Gang kids. The then five-year-old Beard came to the series a year after the transition from the silent/early talkie era Our Gang. He had the exclusive distinction of being with the gang from "Miss Crabtree" talkies of the early 1930s, through the mid-thirties transitional period, up until the era of the more familiar group of Spanky, Alfalfa, and Buckwheat, who would ultimately replace Stymie in 1935. His younger sister Betty Jane Beard preceded Stymie in the gang, playing Farina's little brother Hector in Moan & Groan, Inc. and When the Wind Blows (even though she was a girl). His younger sister Carlena Beard appeared as Stymie's younger sister in Shiver My Timbers, Readin' and Writin', and For Pete's Sake!. She did not appear in The First Round-Up. Willie Mae Taylor played "Buckwheat", a role which would eventually be converted to a male character and given to Billie Thomas. 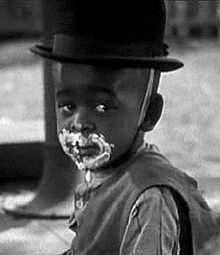 His younger brother Bobbie Beard appeared in six Our Gang shorts from 1932 to 1934 as Stymie's younger brother, "Cotton." His mother, Johnnie Mae Beard, has a cameo as Stymie's mother in Big Ears and Free Wheeling. Beard's younger brother Renee Beard would appear in Hal Roach's Our Gang-derived featurettes of the 1940s: Curley and Who Killed Doc Robbin. After Beard left the series in 1935 at the age of ten, he went on to score some minor roles in feature films, such as Captain Blood (1935) starring Errol Flynn and Jezebel (1938) with Bette Davis. At the age of 15 he made an appearance and was credited as "Mose" the bellboy in the 1940 Fritz Lang directed The Return of Frank James with Henry Fonda and fellow child star (and Our Gang alumnus) Jackie Cooper. By the time he was in high school, he had retired from acting. Falling into drug use and street life, Beard became addicted to heroin. He spent most of his early adult life in and out of jail on drug and theft charges. In the 1960s, he checked himself into Synanon, a drug rehabilitation facility in Los Angeles, and successfully ended his heroin use. After leaving Synanon, he made a small comeback, appearing in small roles in feature films and episodes of television shows such as Sanford and Son and The Jeffersons as a guest star (including two episodes of Maude as a resident of an apartment complex where the title character's husband temporarily lived) and Good Times where he had a recurring role (1974-1977) as "Monty". In 1978, he appeared in the movie The Buddy Holly Story as a member of the backstage crew at the Apollo Theatre, wearing his trademark bowler hat. Beard traveled around the country, giving lectures on drug-abuse awareness. Beard suffered a stroke on January 3, 1981 (two days after his 56th birthday), sustained head injuries from falling down a flight of stairs, and died of pneumonia on January 8, 1981. He was residing in Los Angeles, California, at the time of his death. He is interred in the Evergreen Cemetery, Los Angeles. He was buried with the famous derby hat he wore all his life, from his Stymie days. ^ "The Return of Frank James (1940)" – via www.imdb.com. ^ a b c "Matthew 'Stymie' Beard - Biography - IMDb". ^ a b c "Matthew 'Stymie' Beard". IMDb. Holmstrom, John. The Moving Picture Boy: An International Encyclopaedia from 1895 to 1995, Norwich, Michael Russell, 1996, p. 132. Dye, David. Child and Youth Actors: Filmography of Their Entire Careers, 1914-1985. Jefferson, NC: McFarland & Co., 1988, pp. 13–14. Willson, Dixie. Little Hollywood Stars, Akron, OH, and New York: Saalfield Pub. Co., 1935. This page was last edited on 15 March 2019, at 02:25 (UTC).